Review the complete list of chapter structure models to determine which one is right for your group. If you are interested in pursuing one of these models, contact Sigma staff. In this model, one school of nursing works by itself to start a new chapter that is centered at its institution of higher education. To start a new chapter with one school of nursing, groups shall progress through each phase of development, systematically completing all tasks outlined with each phase of development. After completion of phases 1, 2, and 3, groups pursing chapter charter status must complete the New Chapter Charter online application as part of the phase 4 process. In this model, two or more schools of nursing work together to start one chapter. Sigma calls this chapter model an at-large chapter. In some areas or countries, two or more schools of nursing may find it beneficial to join to form one Sigma chapter. There is no limit to the number of schools that can collaborate within one at-Large chapter. Note: Schools of nursing that have more than one campus can only create an at-Large chapter with the other campuses that have their own school of nursing dean/head of program. Otherwise, the campuses would be all combined in one regular chapter. Two or more small schools of nursing who join to meet the minimum number of members to form a chapter. All schools of nursing within a country who join to involve all nurses and utilize as many resources as possible. Two or more schools of nursing in different countries, but who are in close geographical proximity and wish to collaborate to form an at-large chapter. Involving nurses from various institutions of higher education, practice settings, and locations may take more coordination for communication, meetings, and events. Depending on the distance from each institution of higher education or practice setting, meetings and events may need to be held at each location. Some members may not want to participate in activities that involve significant travel away from their own school. To start a new at-large chapter, the group shall progress through each phase of development, systematically completing all tasks outlined within each phase of development. After completion of phases 1, 2, and 3, groups pursing chapter charter status must complete the New At-Large Chapter Charter online application as part of the phase 4 process. In this model, an institution of higher education may partner with a practice setting to form a new at-Large chapter. In some areas or countries, one of more institution of higher education and practice setting may find it beneficial to join to form one Sigma chapter. There is no limit to the number of schools and practice settings that can collaborate to form one new at-large chapter. A practice setting is an entity where professional registered nursing is practiced. Practice setting must be accredited by an appropriating body recognized by the Sigma Governance Committee. Practice setting administration and chief nursing officials must agree to support a Sigma chapter at the institution of higher education. Institution of higher education grants a minimum a baccalaureate degree or equivalent in nursing. School’s nursing programs are accredited by an appropriate accrediting body recognized by the Sigma Governance Committee. Obtained support from the institution of higher education and the educational unit with the nursing program for a Sigma chapter. Offers students and members greater access to nursing leaders in the community. Helps foster greater collaboration between the groups. Increases the visibility of Sigma in the workplace. Promotes engagement, satisfaction, and retention of clinical nurses. Formalizes an already existing partnership between the two groups. Higher level of communication and coordination to reach all members. Ability to offer diverse programming for all levels of nursing through a variety of processes. Decreases member participation if there is a significant distance between school and practice setting. To start a new at-large chapter with an institution of higher education and practice setting, groups shall progress through each phase of development, systematically completing all tasks outlined within each phase of development. After completion of phases 1, 2, and 3, groups pursing a chapter charter must complete the New At-Large Chapter Charter online application as part of the phase 4 process. In this model, an existing chapter adds a school of nursing to its existing charter. This process is called an amendment. There is an application and review process for amending a charter. The process is somewhat faster than chartering a new chapter because the Sigma Board of Directors gives final approval for amending a chapter’s charter. In 2011, Sigma approved a new procedure for adding additional schools of nursing to an existing chapter to form an at-large chapter. Groups wishing to join an existing chapter are no longer required to form an independent honor society and operate for a full year. They may simply follow the suggested process for establishing a collaborative relationship and then operate as a prospective at-large chapter for 6-12 months. Once the groups can demonstrate a collaborative history according to the suggested guidelines, they may complete the Chapter Charter Amendment online application. School of nursing grants a minimum of a baccalaureate or equivalent degree. If the school offers a degree that is not called a baccalaureate degree but may be equivalent, send a copy of the curriculum to staff for review by the Sigma Governance Committee. School of nursing’s programs are accredited by an appropriate accrediting agency recognized by the Sigma Governance Committee. For groups within North America, the accrediting agencies would include NLNAC, CCNE, or ACNE. 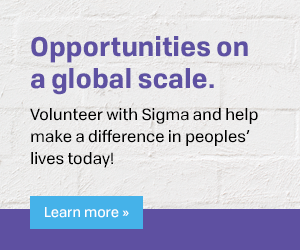 For groups outside North America, please contact Sigma staff. University administration and school of nursing officials must agree to support a Sigma chapter at the institution of higher education. More logistical issues for meetings and events. More planning and communications required for elections, leadership, transition, programming, member communications, and finances. Depending on how far apart the institutions of higher education are, each school of nursing may need to have events at their campuses in additional to larger, chapter-wide activities involving all institutions of higher education that are a part of the at-large chapter. In this model, an existing chapter adds practice setting(s) to its existing charter. This process is called an amendment. There is an application and review process for amending a charter. The process is somewhat faster than chartering a new chapter because the Sigma Board of Directors gives final approval for amending a chapter’s charter. In 2015, Sigma approved a new procedure for adding a practice setting to an existing chapter to form an at-large chapter. The practice setting(s) must follow the process for establishing a collaborative relationship and then operate as a prospective at-large chapter for 6-12 months. Once groups can demonstrate a collaborative history according to the suggested guidelines, may complete the Chapter Charter Amendment online application. Practice setting must employ nurses with a baccalaureate degree (or equivalent) or higher. Must be accredited by an appropriate accrediting agency recognized by the Sigma Governance Committee (such as the Joint Commission or equivalent). Practice setting must agree to support a Sigma chapter at the practice setting in collaboration with the institution of higher education. Formalizes an already-existing partnership between the two groups. Ability to offer diverse programming for all levels of nurses through a variety of processes. Decrease member participation, if there is significant distance between school of nursing and/or practice setting.